Can I Use a VCR with a Digital TV? You certainly can use your old VHS VCR with a new Digital TV. You can even record if you want, but you probably won’t. So how do you do it? Since the completion of the Digital Switchover Analogue TV signals are no longer broadcast. This means VCRs will not be able to record any TV signal by themselves. However this does not affect playback. As long as your VCR has AV out you’ll easily be able to connect it. If you want to record Digital TV on your VCR you’ll need one of two things. 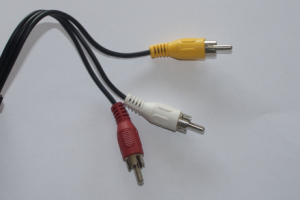 If you have a Digital Set Top Box, you can connect this to an AV input on your VCR. The drawback of this method is that you’ll need to set the channel on the set top box prior to beginning recording as the VCR has no way to change it. Position the VCR near the TV and plug it into power. Locate the AV output on the VCR. It’ll typically be label Video Out, Output or with a symbol of an arrow pointing out of circle. The sockets will be coloured Yellow and White for 2 RCA Mono, or Yellow White and Red for 3 RCA Stereo. Take a 3 RCA AV cable and plug the connectors at one end into the matching AV Output connectors on the VCR. If the VCR only base Yellow and White sockets, just leave the Red plug hanging there not plugged into anything. Locate an empty Video In or AV Input on the back of the TV. Avoid anything marked AV Out or Video Out. Plug the yellow, white and red into the matching coloured sockets. Note the number of the AV or Video input you plug it into. Turn the TV on and turn the VCR on. Put a VHS tape that you know has video on it in the VCR and press play. Pick up the remote control and press the Input or Source button. It may be denoted by an arrow pointing into a circle. On some TVs pressing this button will display a menu which you can use to select the AV or Video in using the arrow buttons and Ok. Other TVs will cycle through the the inputs each time you press the AV button. Use whichever method your TV uses to select the AV or Video input. You should now see the video playing. When you have finished you can use the same Input or Source button to get back to Digital TV.